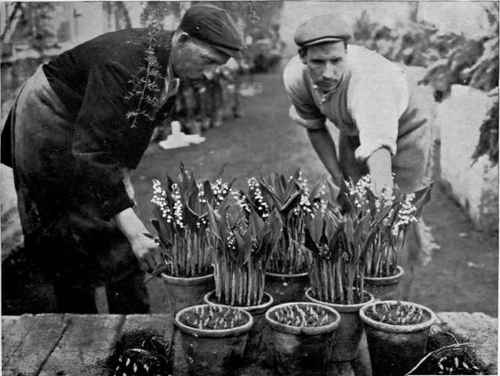 Two florists in a London Flower market admire forced pots of Lily of the Valley, a lost winter traditional pot plant which is due for a comeback. But why wait? I say it's time to force your own. Downton Abby style. 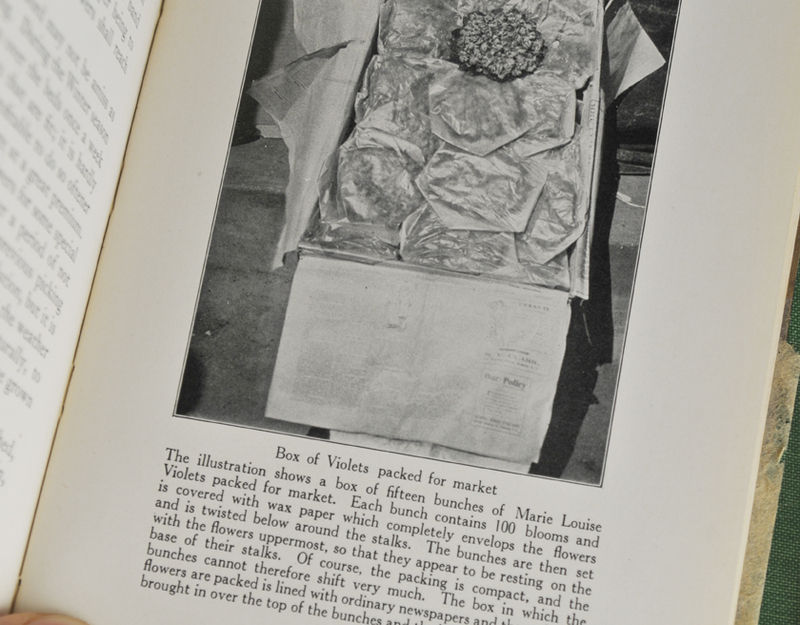 One Hundred years ago, flowers were a luxury item. Aside from a black laurel wreath for a funeral, or simple bouquets for a wedding, flowers rarely entered the home of the working class. 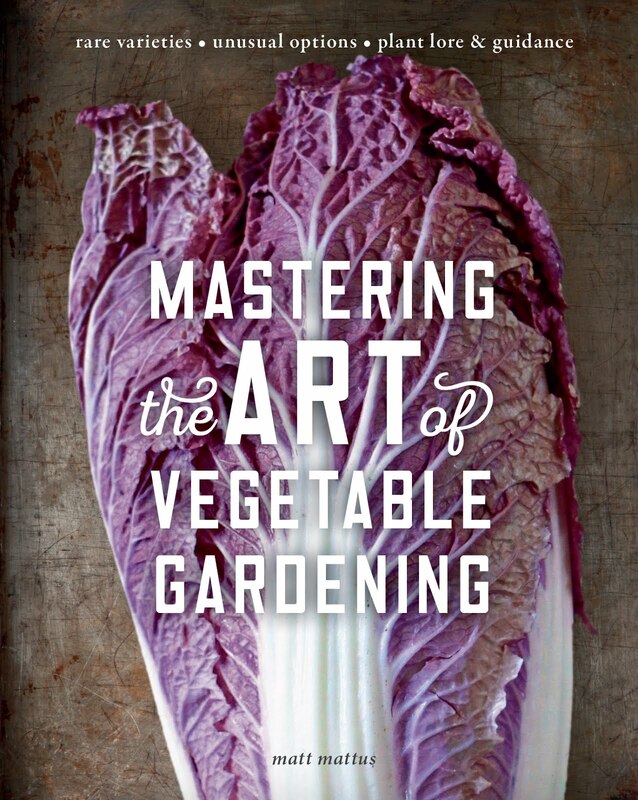 What we know of today from gardening books and documentation, comes from a different lifestyle, that of the privileged - for unless was a gardener or a caretaker, a love of flowers, appreciating their beauty as well as that of nature was a practice of the single lady - the wealthy - the upper class. Everyone else shovelled coal, carried lunch pails or cleaned houses. Today we are fortunate to live in a different world ( I think!). A world where orchids can be found at every hardware store next to inflatable snowmen and reindeer outlined in trailing disco running lights. Ahem. At risk of sounding curmudgeonly and old fashioned - what the hell happened to the poinsettia? 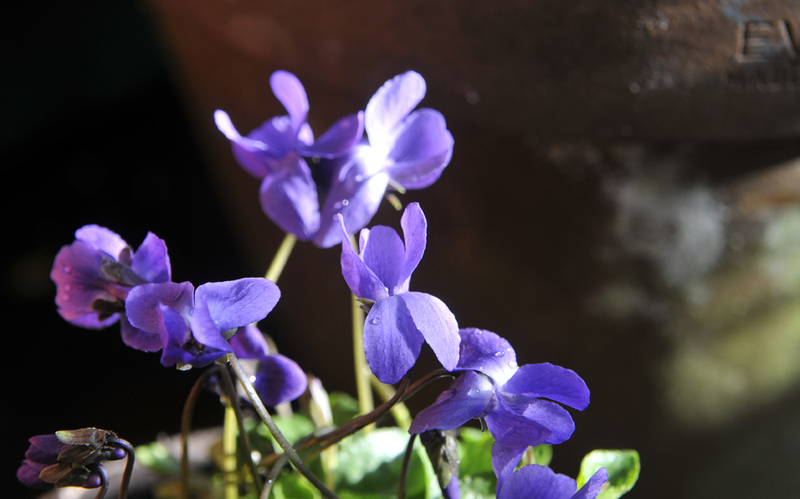 The last time I looked, they were spray painted with glitter and as short as a silk point. They might as well be fake. I think it's time to take Christmas plants into my own hands. 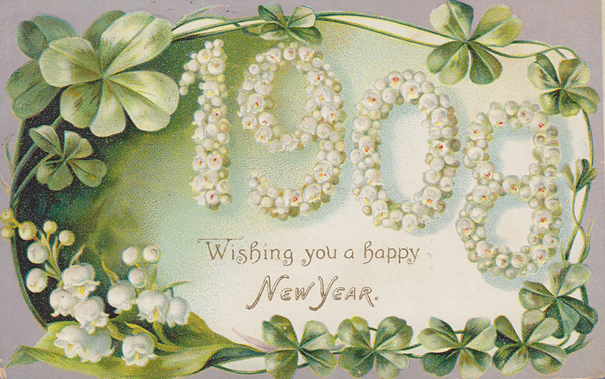 Time to zoom back in time to a quieter and more realistic era, that of 1805 to 1900. I am forcing my own Lily of the Valley's this Christmas. Why? Well first of all, just try and find some Lily of the Valley pips ( perhaps While Flower Farm?). 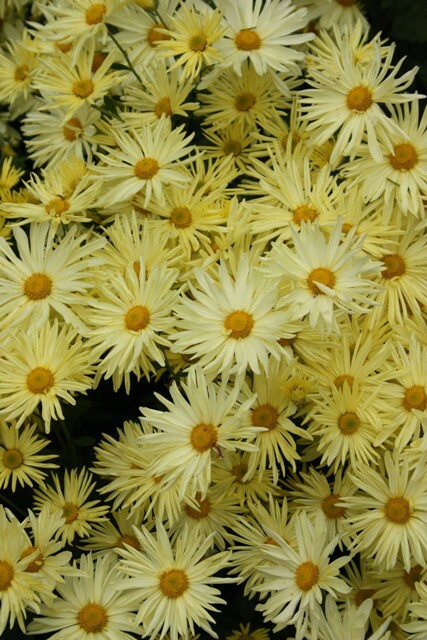 They are impossible to find, yet I have a yard full of them. 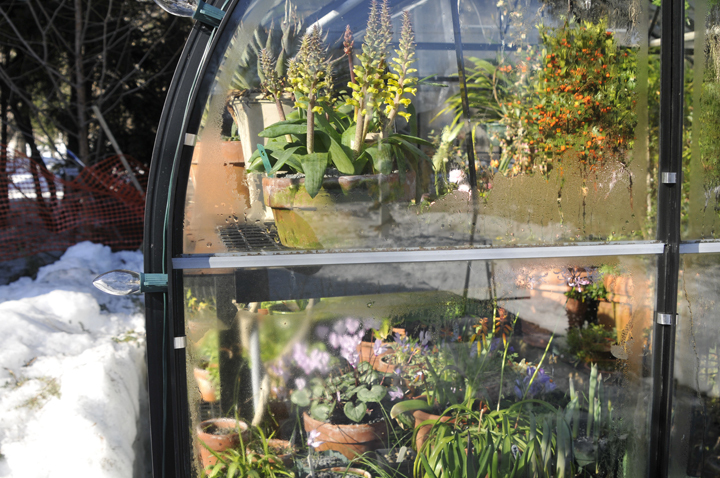 Second, you know I am a huge fan of forgotten flowers - those lost gems of Victoriana, the 18th and 19th Century when greenhouses and glasshouses first came into fashion, and thirdly - I am cheap. Yeah, finally I can admit it. 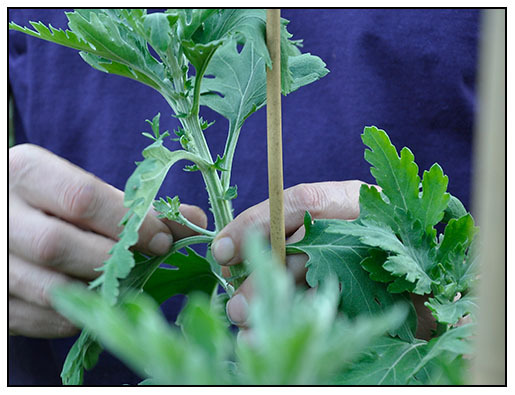 I just can't bring myself to pay $75 dollars for 2 dozen pips to plant in a pot or two. My dad said that he and my mom always used to force their own at the Holidays ( often starting at Thanksgiving, even before that, potting up pips in mid-October, but as we are having a mild winter, enough so that I can still dig in the soil, and because in the past, my mail order sources delivered pips around Christmas, I figured, why not try my own. We've lost so many horticultural traditions that surround Christmas. 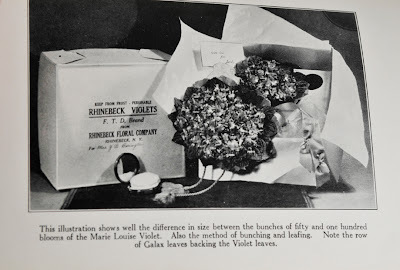 There was a time when white and red anemones, large white Christmas roses ( Hellebores), ruscus, Holly, Cyclamen, chrysanthemums, violets and Lily of the valley meant Christmas flowers. 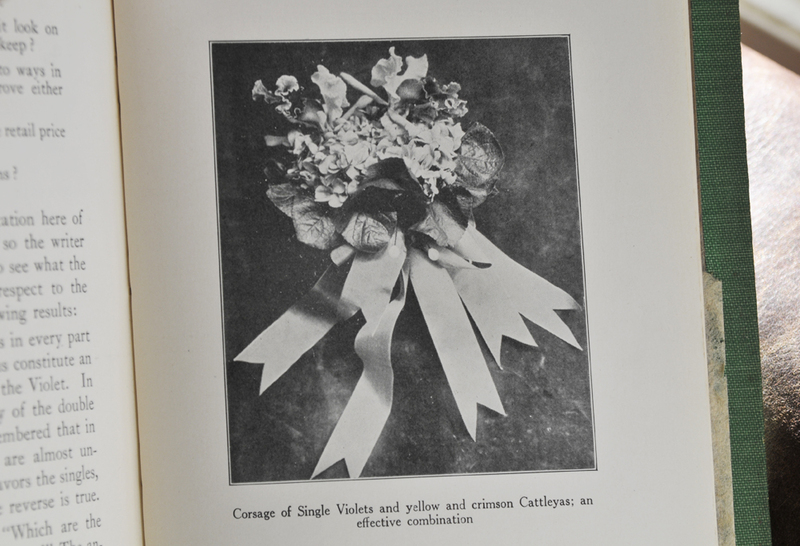 Even as recent as one hundred years ago, Christmas flowers were quite different. In some family photo albums from 1912, many of the flowers which we associate with the Holidays season were still unheard of yet images of camellia corsages from local florists appeared on everyone. 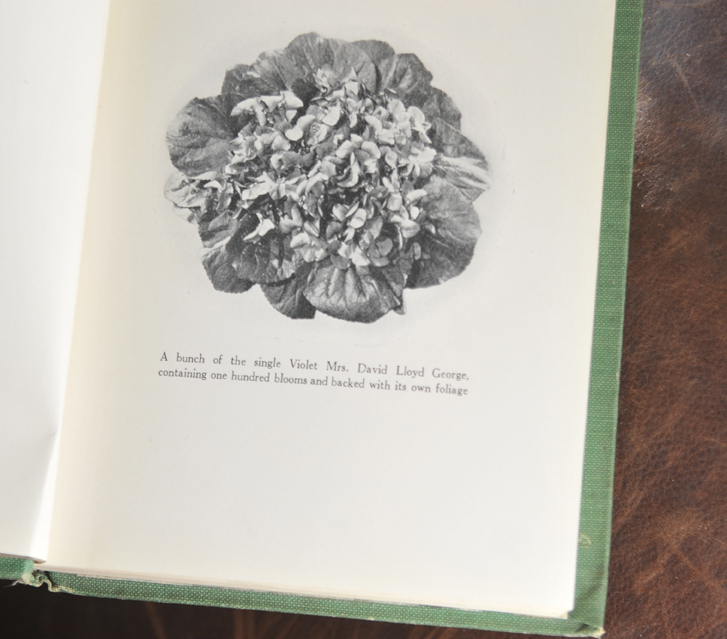 Like Petticoats and waistcoats, fashions change with time, and in the world of flowers, change happens just as quickly, but throughout the 18th and 19th Century, most Holiday plants and flowers remained the same. 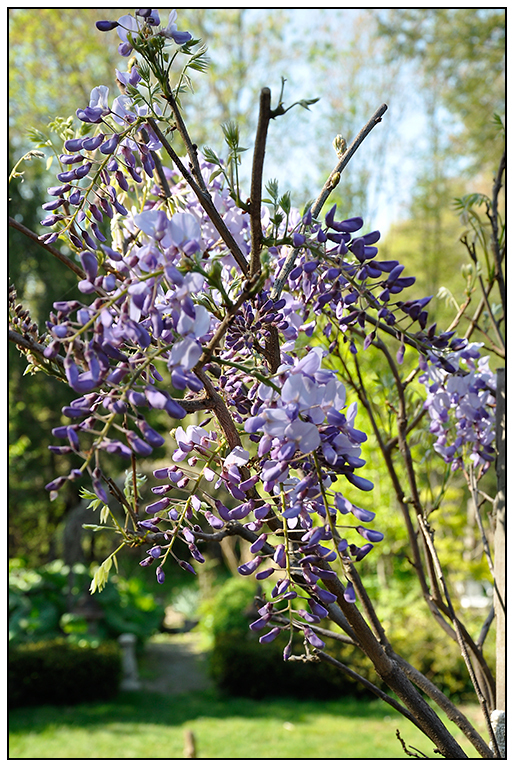 Before poinsettia and silk flowers, there were only those plants found in ones own garden, or if you lived near a large city where florists could be found, those plants and flowers which could be forced into bloom during the shortest days of the year. 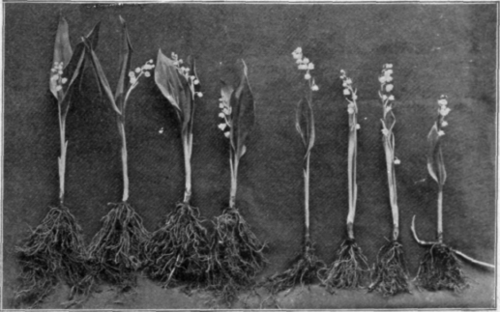 1910 Lily of the Valley plants from a florist show some variation. Not all garden-dug pips will produce flowers, but most will. 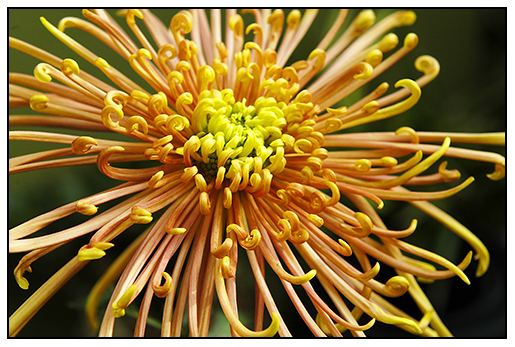 The larger the pip, the taller the floral stem. 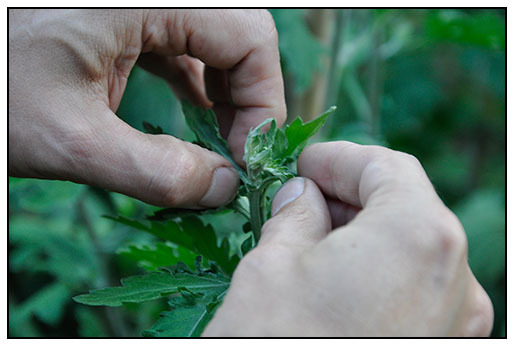 Forcing such plants required skill and the proper materials. 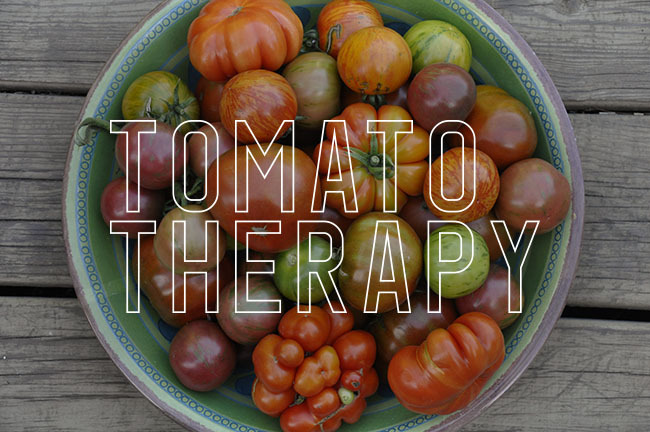 Not unlike many of the forced vegetables in the 1800's. Lily of the Valley were forced In hot beds, deep with manure and steam pipes, kept under cold glass with hot steam pipes running beneath the plunge. 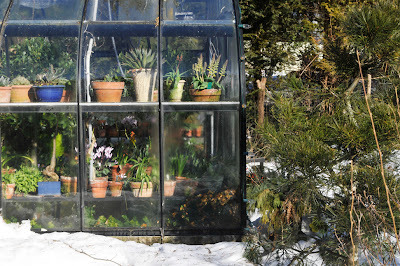 Pots could be forced into fragrant bloom from late December until April no matter how deep the snow was. 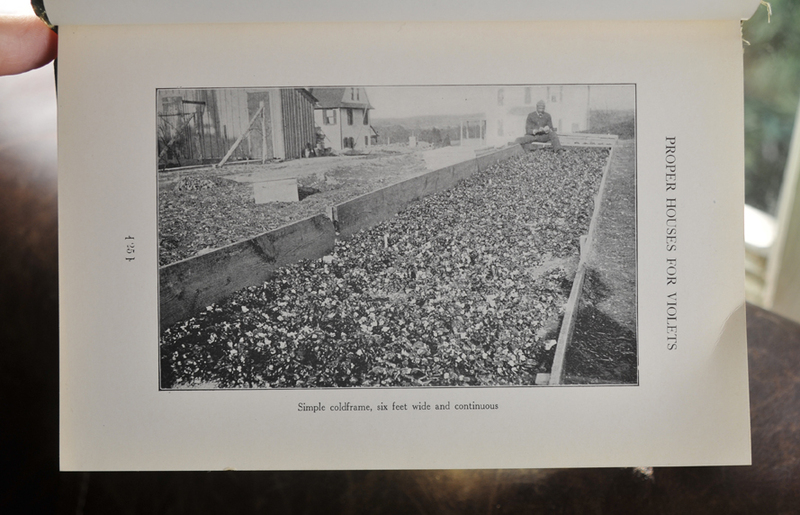 In 1900 most American and European home gardens had many greens and plants which could be dug for the Holidays. Of course there were fresh picked Holly greens, pines, spruce cones for craft and other evergreens as well as tiny woodland plants, especially those with red berries. In Europe, where Convallaria is native, the flower was often a traditional New Years flower, often strung on threads like pearls and used as a fashionable element for proper ladies. But from the florists, there could be found many choices which had been so traditional for generations whether one had their own hot houses for force in, or money to purchase such luxuries from the local greenhouse. Christmas at the turn- of-the- last century meant tables with Hellebores, white Anemones, white chrysanthemums, and yes - white lily of the valley. My own lily of the Valley pips show how many roots they can have. 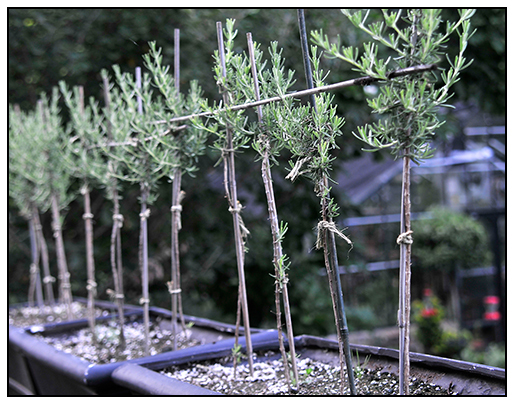 My hands were frozen, but I was able to carefully dig a few clumps out that look liked they have strong buds or pips. 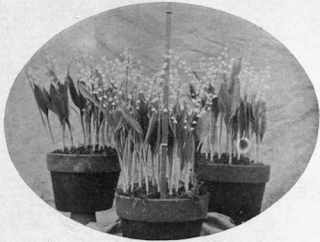 In 1910, all well appointed plant supply catalogs offered cleaned Lily of the Valley pips for home growers to force on windowsills and in their home greenhouses, in fact, until WWII, Lily of the Valley pips were as common as Paperwhite Narcissus are today. 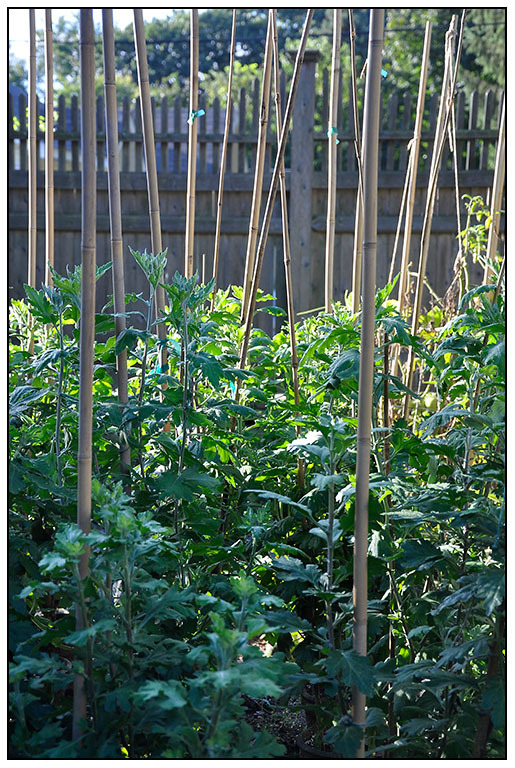 Old time gardeners used to trim roots back by half, from their own rooted stocks, but I have found that a little rinse under the green house hose is enough. 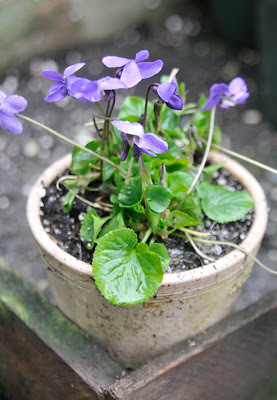 I fit as many as I can squeeze into a clay pot, add fresh soil and a gravel mulch, and then bring them into the house to force at warmer temperatures. Easy peasy. Some older books suggest that bottom heat is better than a hot room, some even suggesting that one keep pipes of hot water underneath pots bringing the temperature of the pots up to 85ºF while the room remains near 50º, ( i.e radiators or a nearby fire which is allowed to go out at night for that all important temperature shift) but I have found that by placing pots of freshly planted pips under lights which are on a 16 hour cycle an easy solution. 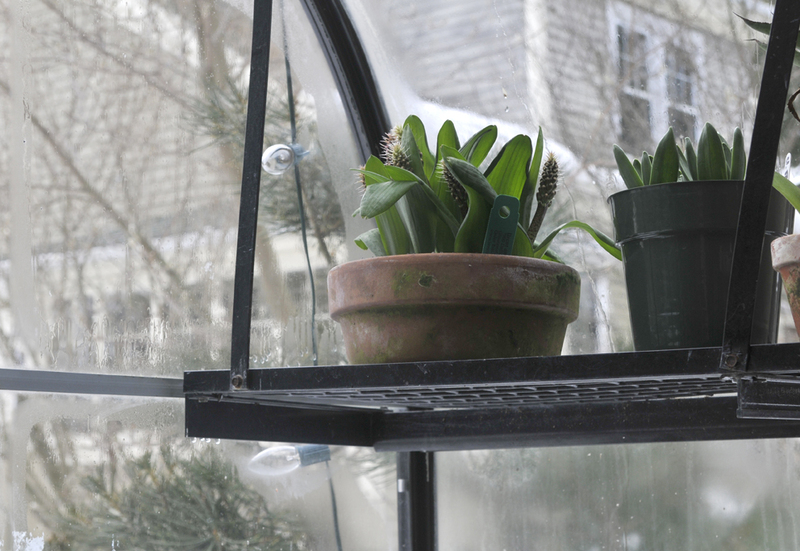 Pots also work well on a cool windowsill, but pots which I keep in my cool 40º greenhouse slow down, often taking 5 weeks or more to bloom. In Germany the Poinsettia was not a common Holiday plant. Here, where Christmas trees and Chrismas greens come from, the Lily of the Valley reigned as the choice, proper Holiday flower. What happened? I think the Lily of the Valley needs a new marketer, for somehow, we have forgotten all about it. I spend so much time studying these lost trends in old books, but the idea that one can force ones own Lily of the Valley always captivated me. 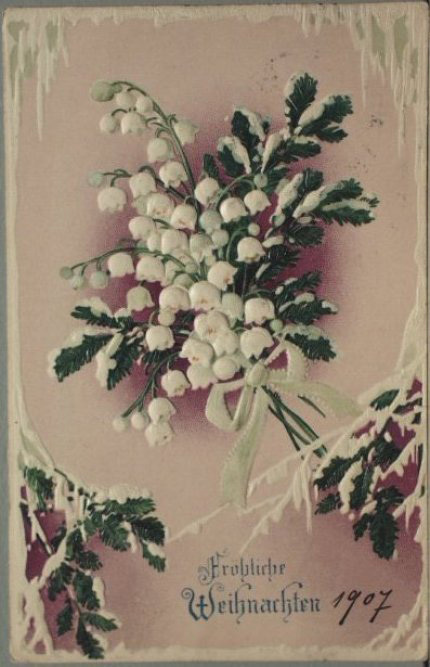 Victorian Christmas cards often showed clusters of Lily of the Valley, often alongside early camellias, Hellebores and even illustrated along with berries and holly. How in just one hundred years could such trends become lost? Such memories become forgotten? I suppose the twentieth Century killed many traditions, and yet I doubt that today's Christmas icons of silk poinsettias or Rudolf will ever go away one hundred years from now, but I can't help but feel some sadness that all silk or plastic poinsettia found at local craft stores are modeled not after authentic tall poinsettias but instead, are modelled ironically on those which have been drenched with growth hormones to be less than 14 inches tall, a more manageable size for shelving units in shipping trucks and for peoples home. 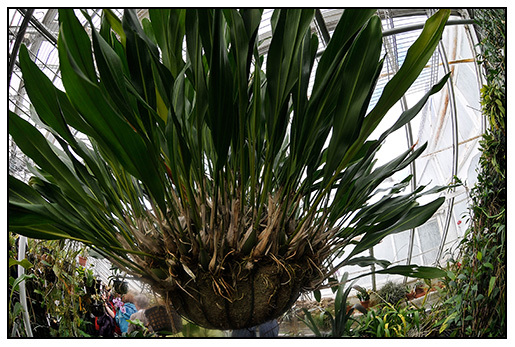 So sad that we are now reproducing genetically altered plants and oddly iconizing them. Future generations may never know what proper Point looks like. In an effort to celebrate the gardening method of a century ago, I am going to force some of my own Lily of the Valley this year. 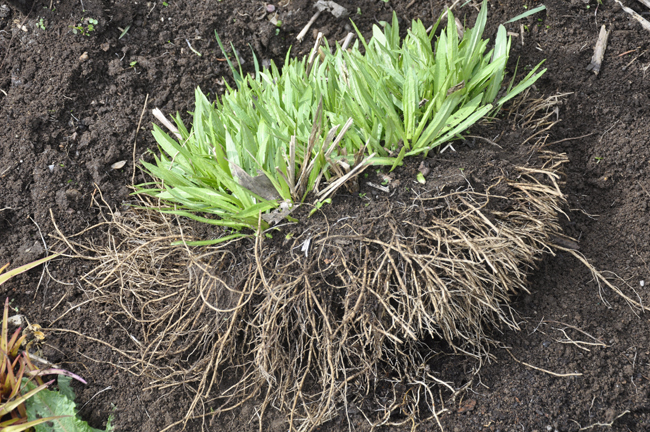 Here in New England, we have been experiencing a mild December which has allowed me to dig a large clump (mat) of Convallaria ( Lily of the Valley) up from the front garden. If you have Lily of the Valley out doors int he garden, you must try and force some this year. 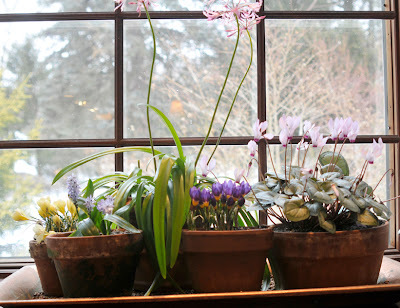 If the soil is still soft, see if you can dig a few clumps up - they will force easity on a cool windowsill. Once dug, I cut the mat of roots into pot-sized clumps, rinsing them off in water so that I could carefully see the pips or spike which will form the single leaf and flower stem. 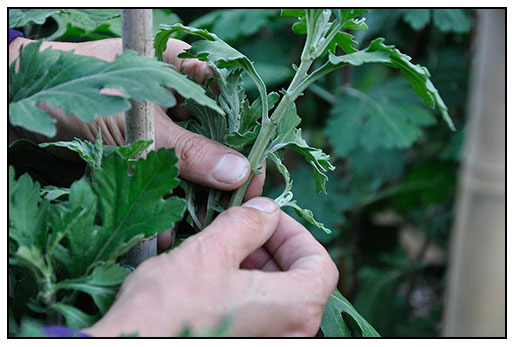 Those spikes with points tips will produce leaves, and those with a blunt end will produce a flower stem. 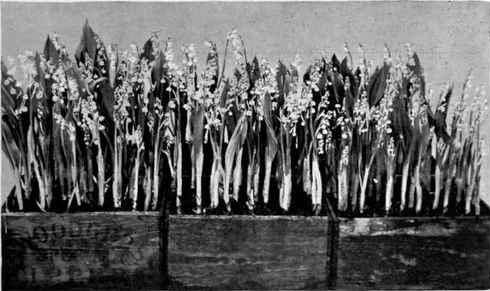 Forcing Convallaria in December is a tradition which goes back at least 200 years, a popular home garden craft in Switzerland, Austria and Germany, where many New Years cards in the Victoria era showed Lily of the Valley flowers. 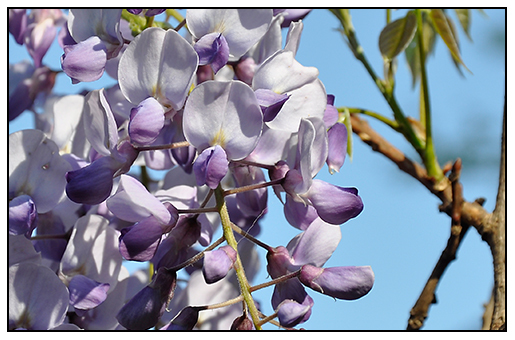 In 1880, the most popular winter cut flower were scented violets, forced lilacs and Lily of the Valley, and even at the launch of the Titianic, guests were treated with garlands of strung Lily of the Valley blossoms and strings of Lilac flowers. In the equatorial house, cycads and palm grow in the high heat and humidity. 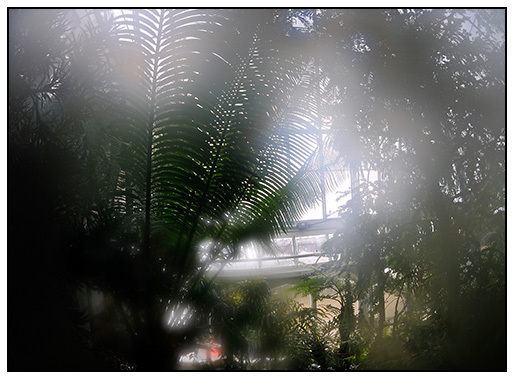 It was so hot and humid in the Smith College conservatory that my camera steamed up - I sort of liked the effect. Here are a few more photos from our trip to the Smith College Conservatory this past weekend. I thought that I might share a few photos of some plants that caught my eye beyond the bulb displays. A little bit of this and that, and a few things to add to my wish list for my greenhouse collection. One could almost miss this tall orchid amongst all the Dutch bulb, but it was its scent that first reached me - a little like a wine glass that had Merlot in it the night before, and then it dried out - I don't know how else to describe it. It was a little like evaporated red wine, and the way an old flannel shirt smells when you are stoking oak wood into a fireplace, with smoke on a cold winters night. Know what I mean? 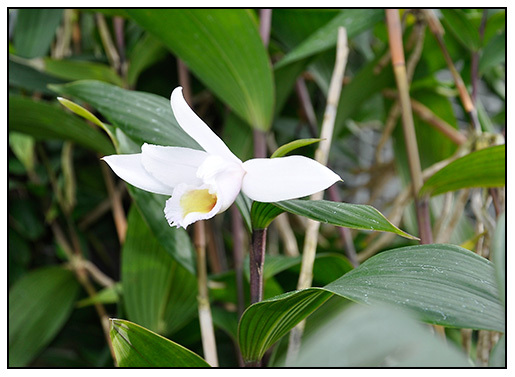 Orchid scents are strange yet awesome. 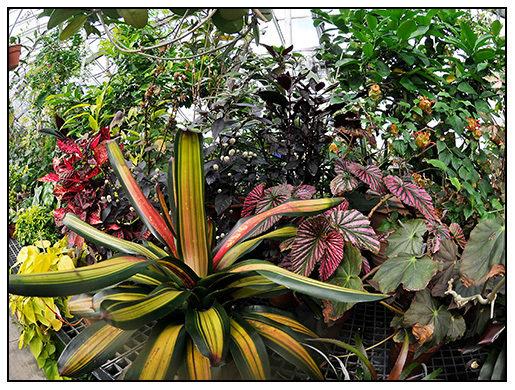 Mixed tropical specimen plants include Begonia species, bromeliads, citrus and lots of orchids. 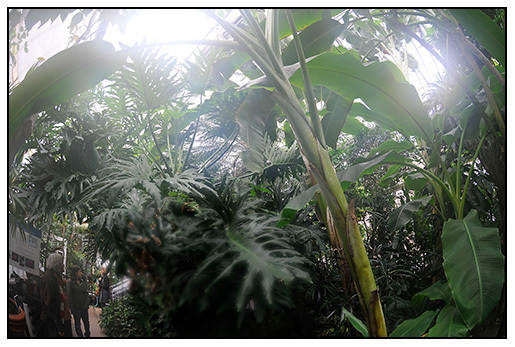 Banana's, Heliconia and Philodendrons in the tropical palm house. Yes, it was snowing outside, but near 90 degrees inside under the glass. 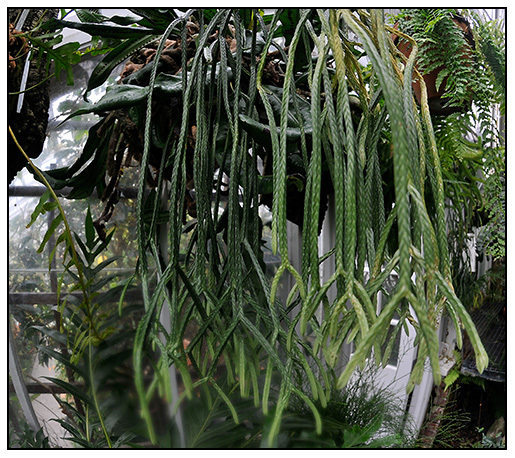 Me likey Lycopodium - as if I need another genus to start collecting! But this is the second time that I have been smitten by this prehistoric genus. Maybe the time has come to build a Victorian Fernery. This was the first time that I've seen this Peperomia species. 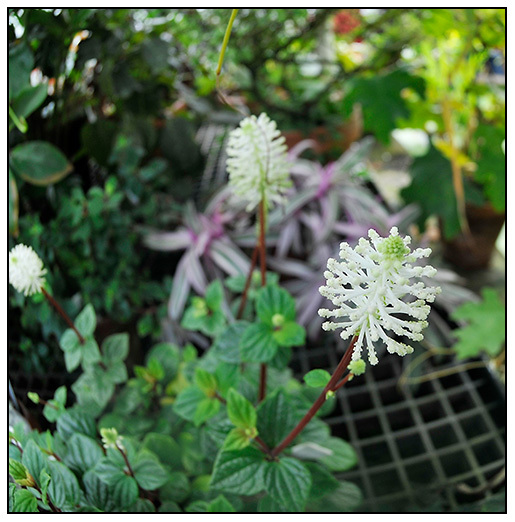 - Peperomia fraseri, from Ecuador and Columbia. 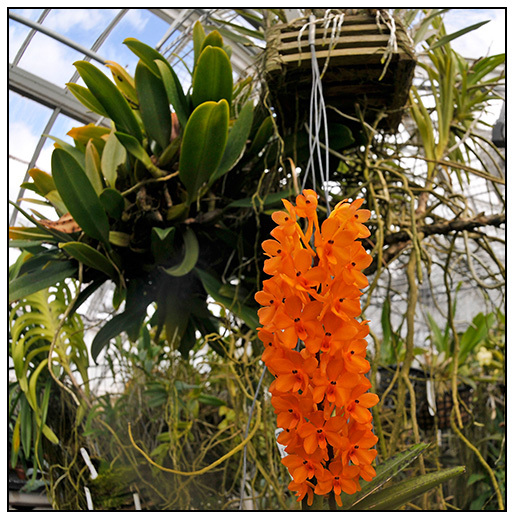 A small hanging Vandaceous orchid reminds me of when I lived in Hawaii - we used to grow baskets of these on our clothes line. Another fantastic orchid specimen, this relative of the dendrobium is Dendrochillum cobbianum , this specimen has fully encased its basket. 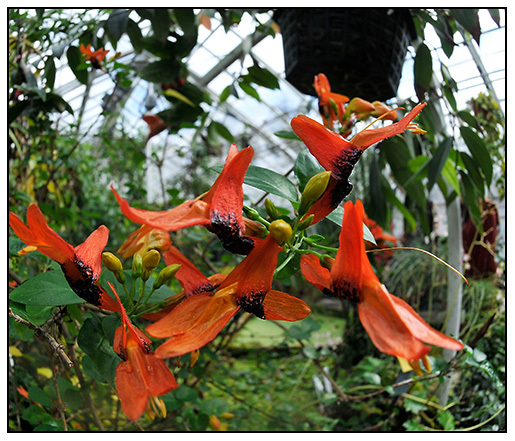 This Ruttya fruticosa was once commonly grown in conservatories in New England, my 1805 gardening book talks about specimens growing in glasshouses in the Boston area. 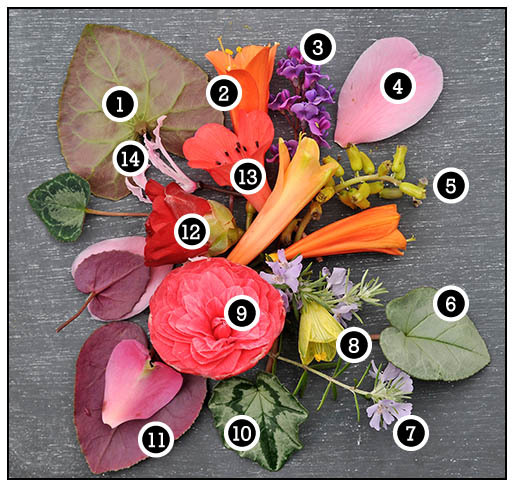 Here is an arrangement for all of my fabulous followers who so kindly invited me to Pinterest. Thanks so much! 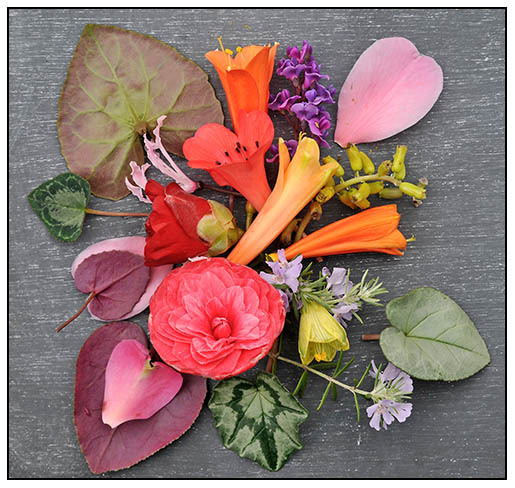 So for you, I made this - A selection of heart-shaped leaves and petals from my greenhouse on an cold, overcast and snowy, winter day outside of Boston. Clivia x Interspecific - cross between C. miniata and C. caulescens ( three color versions shown), all from Mr. Nakamura in Japan. 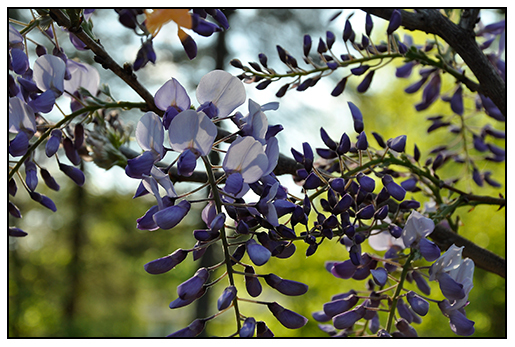 Hardenbergia violacea - old fashioned greenhouse vine, a winter-bloomer for cold greenhouses from Australia with brilliant blue-violet pea-like flowers in wintertime. A petal from a variegated Camellia. Muscari macrocarpum 'Golden Fragrance' - a fragrant, chartreuse Muscari, or grape hyacinth. Cyclamen hederifolium 'Silver Ghost' - a cyclamen with an all silver leaf. Westringia rosemarifolia - it looks like Rosemary, but it's not. 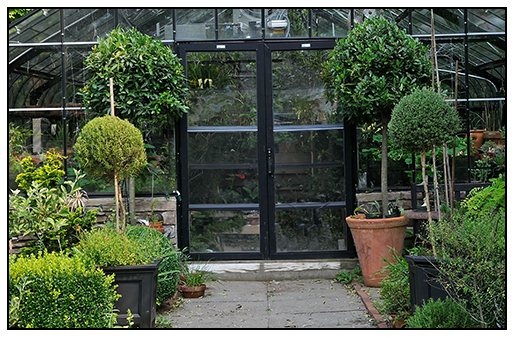 Easy-to-train as topiary or as a clipped dome-shaped greenhouse shrub. 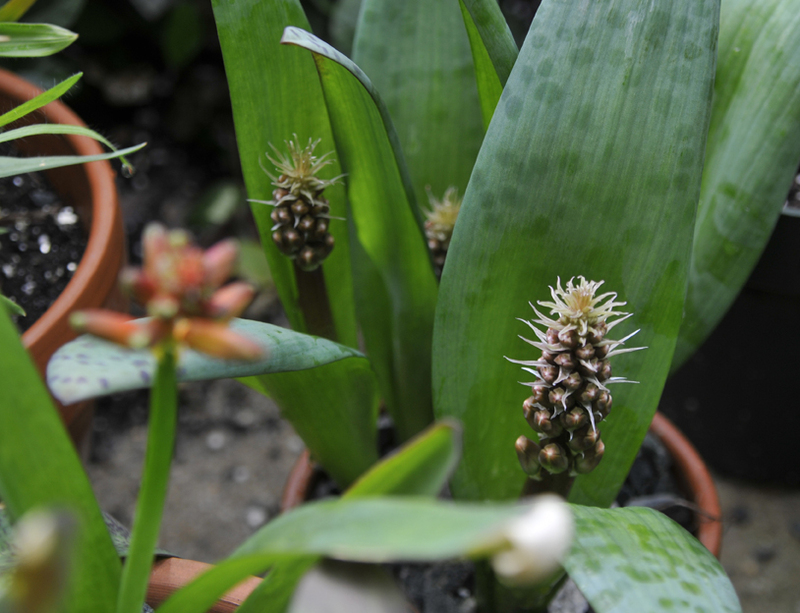 Stenomesson piercii - a rare Equadorian bulb, with greenish-yellow bell shaped blossoms. 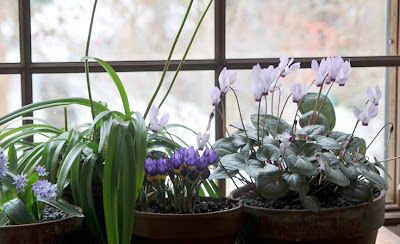 Cyclamen hederifolium - the ivy-leaved Cyclamen. Cyclamen graecum (with a camellia sasanqua petal on it) two, heart shaped objects, the cyclamen leaf has a burgundy back-side, so I displayed it upside down. Camellia japnica 'Lipstick' - an anemone-flowered form. Nerine undulata - a pink, graceful species of Nerine, a tiny bulb in the Amaryllis family, which is easier to grow than other species, and a winter-bloomer. A tray of Dutch bulbs brought in from the cold frames, ready to force in the greenhouse. 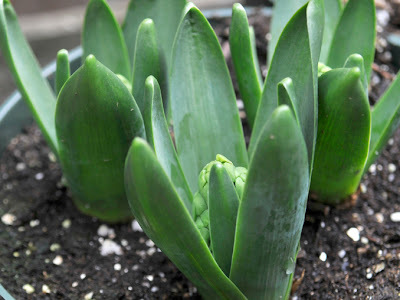 Forcing bulbs. I know, just saying it sounds a bit effected (affected?). You know, in the way one may say " We're taking a tea" or "Release the hounds. Oh so very British, I suppose, and yes, that's where this all began, so we have the British to thank for forcing bulbs, hot beds, and so many fine gardening past times that makes gardening today so, well.....stylish and enjoyable. The very idea of 'forcing bulbs' is not new, it dates back to the 1700's when the trend began with some of the earliest glass houses, or stoves - glass growing structures that were heated, allowing people to grow plants they never could have grown before, and the timing couldn't have been better, as exotic plants were being collected and brought back by explorers sent out by Kew gardens, out to collect rare and new plants all in the name of the Queen. 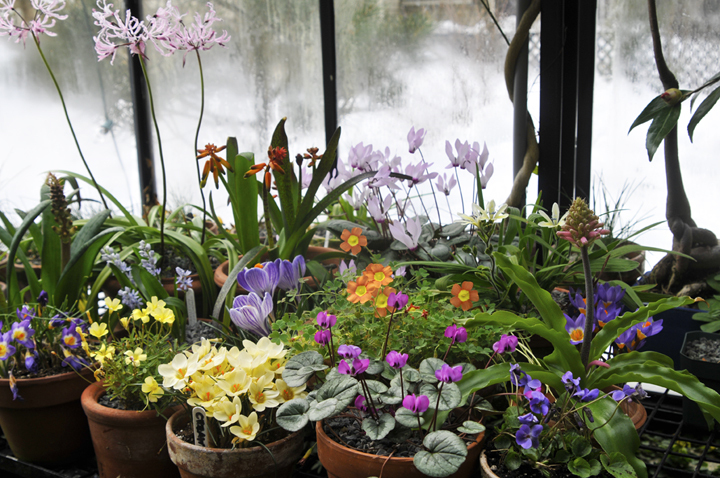 Plants and bulbs were arriving from Turkey and South Africa to be and ultimately, being 'collected' and 'forced' by enthusiasts into bloom in proper British glasshouses, cold frames and hot beds. 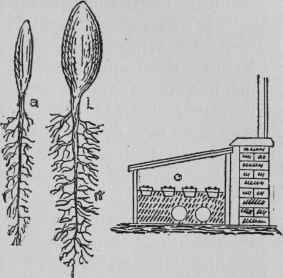 Today, we continue to 'force bulbs', but not exactly with the same passion or tools that the great British horticulturists did. But think about for a minute, if you lived in 1810, how incredible it must have seemed to have fresh pineapple, tulips in bloom and fragrant citrus in the depths of winter. 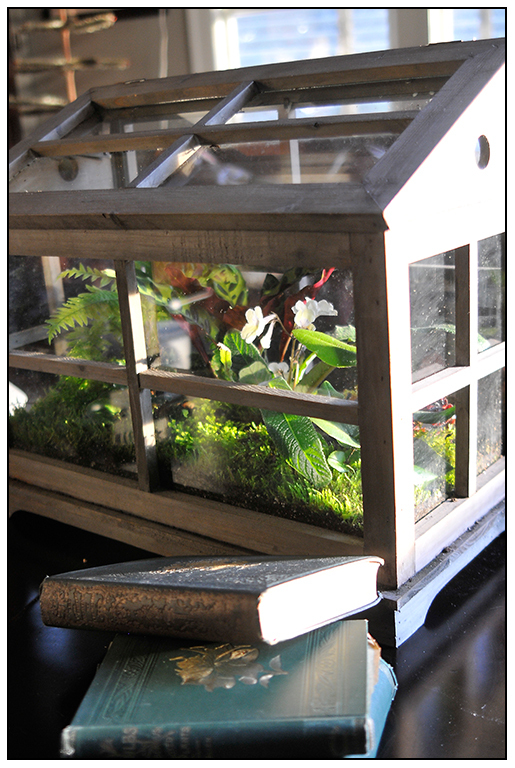 Remember, this was a time when books were even rare, and of course, there was no TV, no radio, no automobiles. In our modern world, the idea of forcing seems rather old fashioned, like many things today, has become diluted and simplified, something that is unnecessary, yet quaint.. 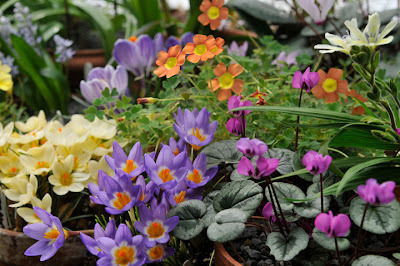 The art, one might say, has lost it's panache - no longer a romantic folly of the wealthy and privileged, who might have wooden coldframes, greenhouses and gardening staff who can take the time to pot up clay pots of Dutch bulbs in October, bury them in sand within the protection of a cold frame, and then, brought into the glasshouse in late winter to be forced into bloom, but rather, it is something that hipsters may try, in much the same way they may raise bees for honey. 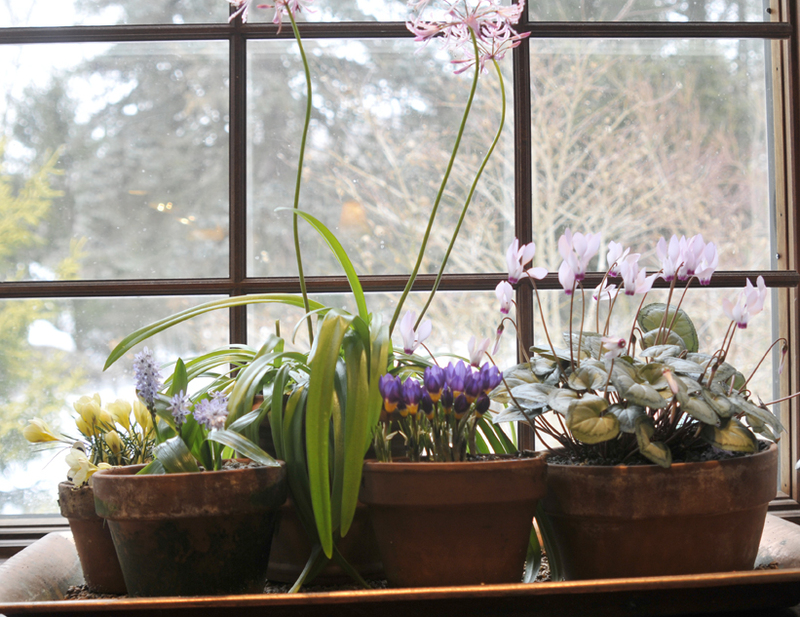 I'm not knocking it, but I will admit that it takes a certain soul to appreciate forcing bulbs, or any plant today, in our modern world. 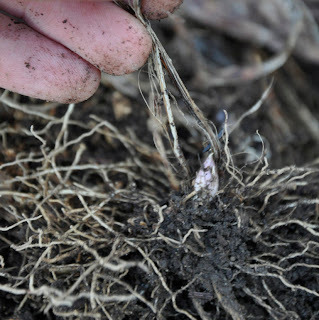 Many garden writers offer advice and guidelines on forcing bulbs. 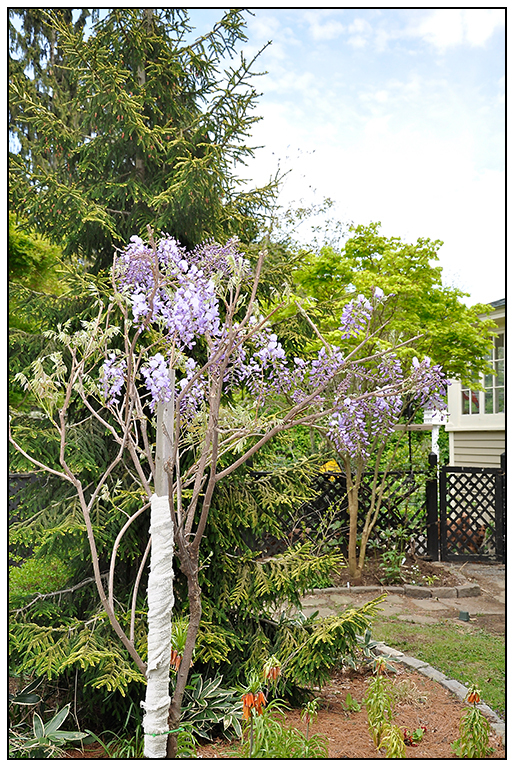 We are advised that we can still 'force' bulbs, but often advised to take the easy route, and, the less romantic. 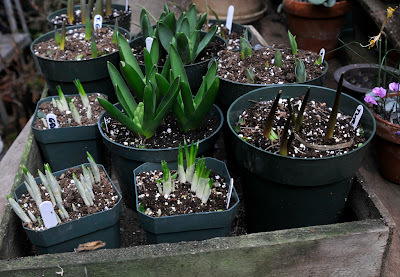 Use plastic pots so they won't crack, buy bulbs at the supermarket on sale in the fall, pot up the bulbs in potting soil from Home Depot, bury the pots in black plastic garbage bags full of leaves that you raked up with your kids, tie it off, and stash it under the deck until mid-winter, and then, bring the pots into the house to force in a sunny window. Hey, it works, but it still isn't quite the same experience. May I suggest a few options, to help improve the experience? I shall. 1. 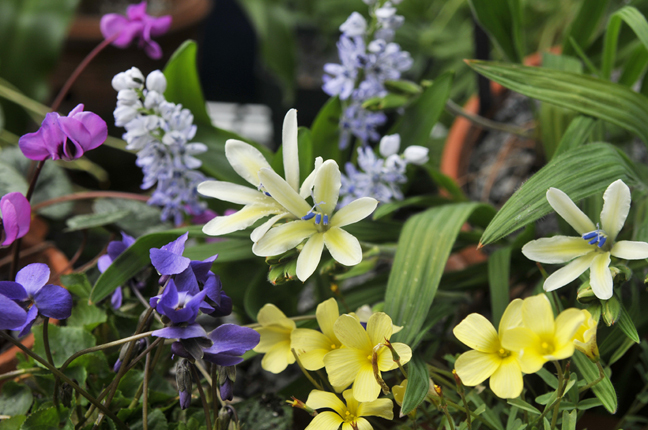 Buy bulbs anywhere, but enjoy perusing the websites and catalogs, and plan a little. Planning on what bulbs to purchase is almost as pleasurable as the actual 'forcing' part. 2. Raise the Bar on the Experience Level at Every Step - Look, you are not forcing bulbs just for the flowers, you hopefully are doing it because you love gardening, so why ruin and waste the entire process just to enjoy a few days of tulips after a long day at work? Use clay pots ( or plastic, and then bury -hide- the pot in a clay pot once brought indoors). Plastic pots won't crack if they freeze, but if you do have a real cold frame, and if the pots are buried in sand and covered with a thick layer of leaves, they will not freeze, and you can use clay. My best advice is to - amp up the experience at every step. Make the experience beautiful, pay attention to every detail, and enjoy the minutia. 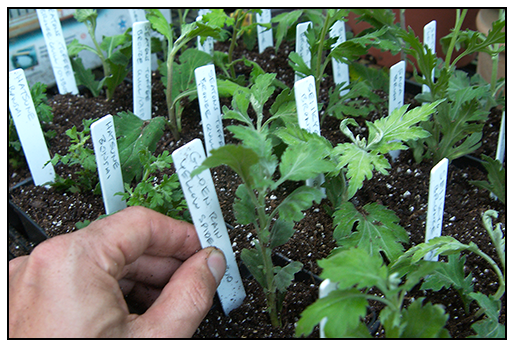 I prefer real wooden cold frames with glass lights, real clay pots preferably hand made, nice sand, nice imported English heirloom trowels, real Haws brand copper watering cans, elegant labels.... make every touch point a pleasure. 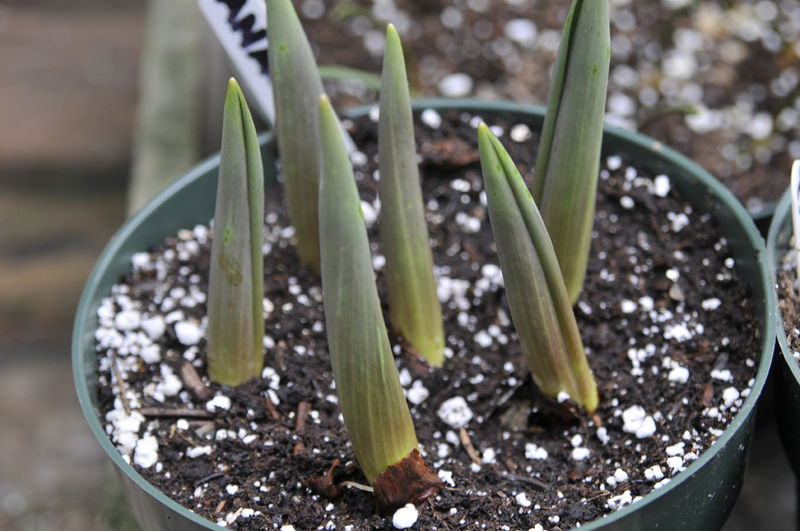 Buy interesting bulbs, experiment with odd, new or rare bulbs. 3. 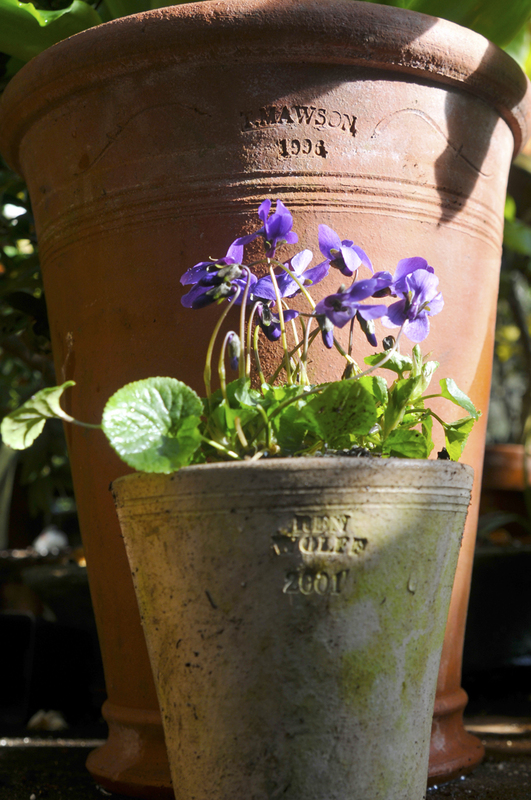 Lastly, exhibit the pots. I designed a bay window over my sink to function as a display window. I had lights installed, so that I can dim the halogen spot, or increase them at different levels, and every weekend, I can set up a display of pots that I bring in from the greenhouse just as a retail store or a botanical garden might. Silly? Maybe, but I don't think so. I invest alot of time and effort, and dollars into my greenhouse, the care of my plants, and in selecting what to grow, I might as well enjoy the results! Lachenalia cultivars almost ready to bloom. 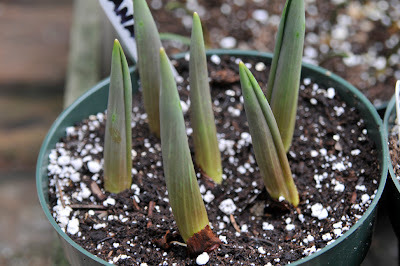 Tulips will tell you that they are ready to be brought into the greenhouse but how long their shoots are. Find the sunniest spot on a windowsill in a cool room, or in your greenhouse to allow the bulbs to slowly emerge into bloom. These Hyacinths are ready to bring indoors where their intense fragrance will make the kitchen smell like a spring flower show.